Here is the sign welcoming me to my sister’s beautiful house. Do a lot of research on places of interest to you. Create a daily to-do list and a plan of attack. Map out destination locations and plan your tour according to distance and proximity. (If there are events, places, and restaurants of interest in the same or close area plan to see those on the day, permitting there is no conflict with dress code or other requirements.) Doing this will allow you and your companions to cover more ground in less time on your trip. Start early in the day on your adventure. Find out in-advance which places are difficult to get into, will most likely will have a wait, and/or requires pre purchasing tickets. Parking? How much does it cost? Is it close to your event or destination? 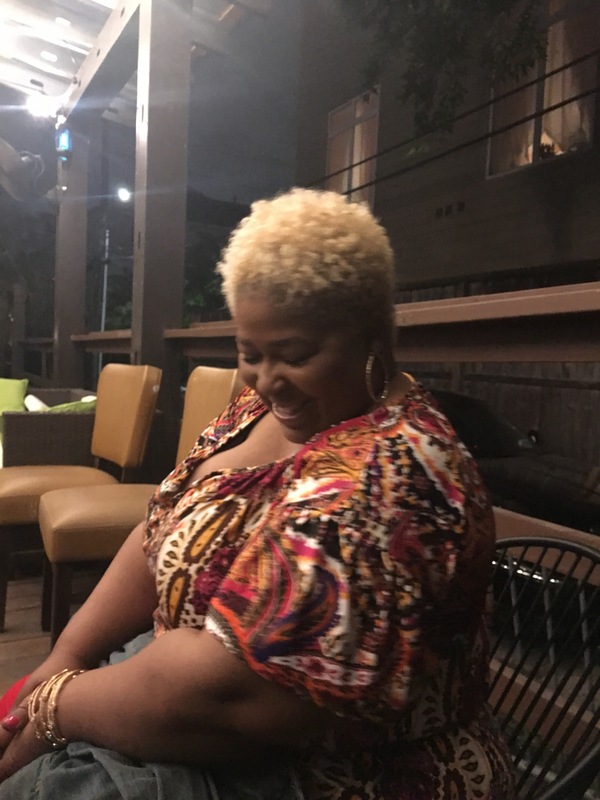 Here I am enjoying the night air at Cowboys and Indians..
Have you ever been to Central Market Gourmet Grocery Store?….This lovely place houses everything noteworthy for making your breakfast, lunch, dinner or event the best of the best. I love, love, love grocery stores… Not just any grocery stores though. I love the kind that inspire me to cook great food or try new ingredients because their ingredients look good enough to eat right there in the store. Isn’t that good looking food when you just want to create something delicious on the spot? From domestic and exotic produce like baby pineapples and kumquats and dragonfruits to cheeses of every flavor and texture, and $17 dollar jams and jellies too. (That is not a typo and I did not buy it. I wanted to though.) The meat department would make you flip it starts from one wall and ends on the other just for the fish and seafood and on the other side is the beef, pork and poultries and its wall to wall too!. Then there is the dried spices and herbs section, it is pretty cool to offer such a broad spectrum of flavors and be able to purchase just what you need. No need to buy a whole jar of anything there if you will never need it again or just want to sample it for your dish. You can just buy what you need. If lived in this area, Central Market Grocery and I would be on a first name basis. 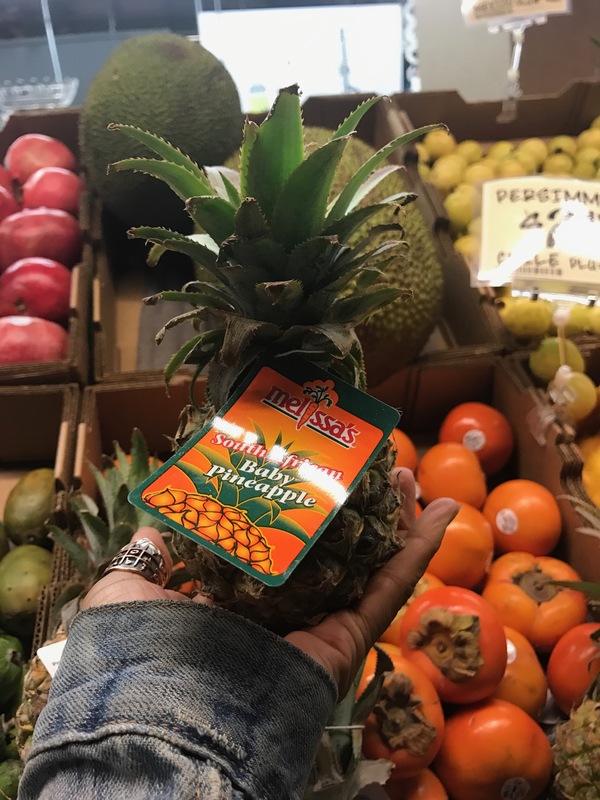 Baby Pineapples and more are available at Central Market. The bakery section has an infinite number of baked goods and fresh breads ready to eat. The Cheese section. That’s all I have to say about that. Cheese is everything. Chef prepared hot foods and cold food selections. Cooking Classes. Yes. Yes. Yes. I could’ve stayed there for one full day, just creating ideas in my head….One day I will. Next time you’re in Texas look for Central Market. You won’t be sorry. 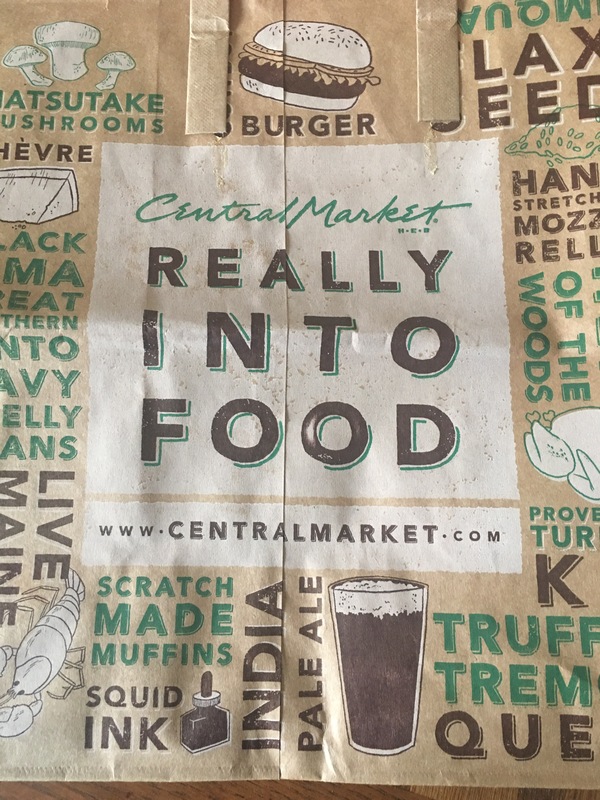 Central Markets shopping bag gives hints to all the awesomeness inside the store. On Friday during my Houston/Austin Texas takeover we visited Bourdreaux’s a Cajun restaurant and bar. 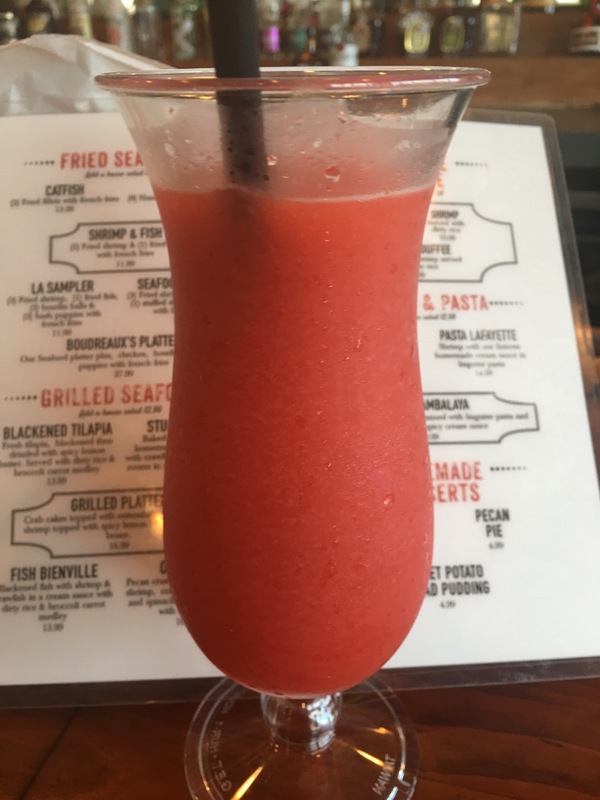 It was early evening and not very busy in the bar section so we sat there and ordered Frozen Hurricanes. I also ordered a basket of Hushpuppies with jalapeno’s. Hushpuppies are especially delicious when they are hot just out of the fryer… Bourdreaux’s served the fried cornbreads with butter. That was new for me. I eat butter always on cornbread, but never considered it for my hushpuppies.. I continued to think further on it. Why not honey butter or why not just honey? That would be delicious…. Savory hot fried cornbread rounds with honey or maybe even a good maple syrup?….. Ok, let me calm down…… I will have to try it at home……In the mean time these hushpuppies make the grade. From Boudreaux’s we ventured on to what is know as “The Flat” a Houston area bar/grill music venue. This hidden gem gave me a bohemian vibe just from the lighting and ambiance… The DJ kept the mood right with music that switched from Hip Hop to R & B without pause keeping us music lovers satisfied. It was still early evening and not a whole lot of patrons, but I appreciated the atmosphere and the beats. The outdoor patio area still had more to offer with the rhythmic sounds playing outside too. The perimeter was enclosed with wooden fencing and lined with planted trees and various greenery. Lighting the early night would be white lined lights. It was beautiful. This place was perfect for a girl like me who appreciates intimate music lounges. No disappointments here. Good music. Good people. Good Vibes. 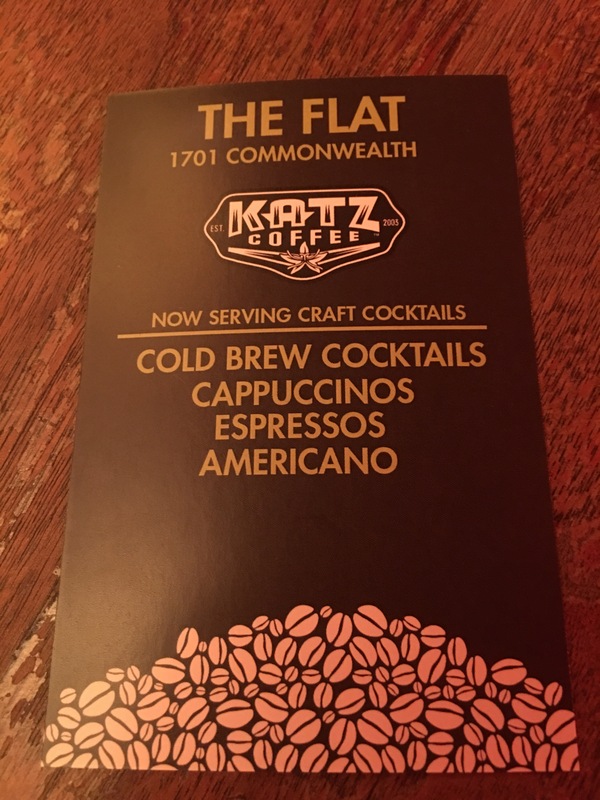 The Flat offers coffee options too I see! The patio in the back of The Flat. From the flat we Uber’ed to Cowboys and Indians. A Tex- In kitchen. Get it? A Texas, Indian Kitchen A blend of Texas American food with the flavors and spices of India is what the description advises. Cowboys and Indians offers a variety of dishes for meat eaters, vegetarians and vegans too. 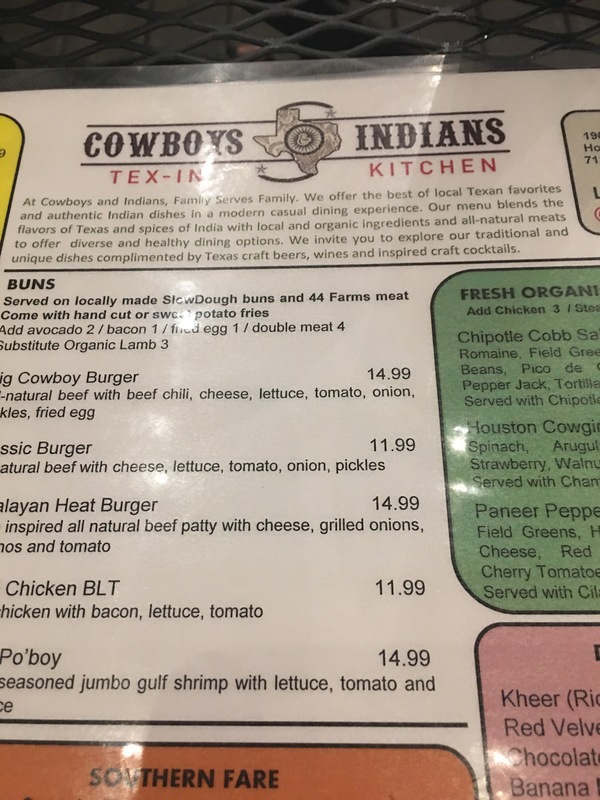 Offering traditional burgers, fries, and salads and american desserts for the Cowboy appetites and if you desire Indian tastings you would be happy to see Butter Chicken Tikka Masala, Lamb Vindaloo, Beef Coconut Curry and more. 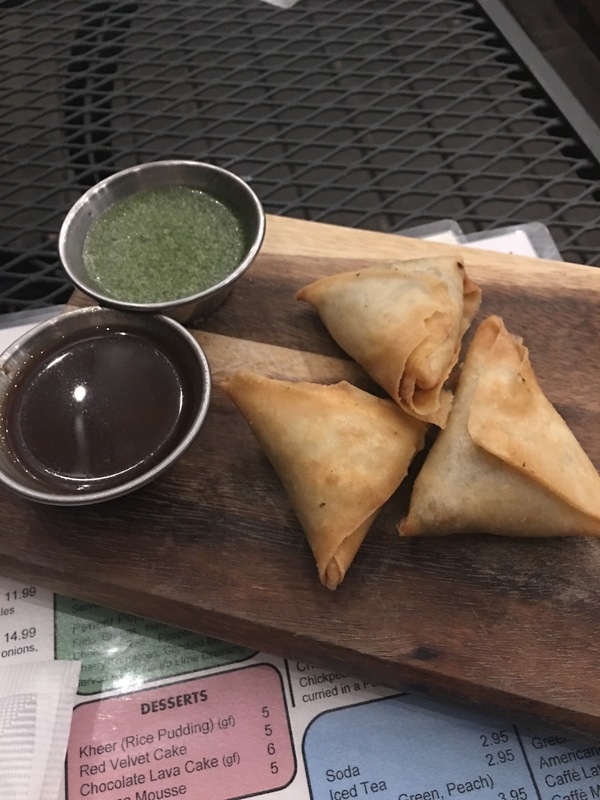 Being semi full from the hushpuppies I decided to go with the Beef Samosa’s (flaky pastries filled with ground beef and onions). I opted out of the offered dipping sauce for traditonal barbeque sauce. Mi hermana (my sister) offered the no meat option of this same dish. Hers was filled with curried potatoes and peas. She also had the crispy fries. We sat outside in the covered patio section, the weather was threatening to rain and the sprinkles were beginining when we arrived but with the patio being covered there were no worries of being saturated by the water. So far I can say that I love the option of being able to dine outside at a lot of eateries. This is one my favorite things in Texas. Me again, in the covered patio section of Cowboys and Indians. Lastly on this weather perfect Friday night we made our final appearances for the evening at The Alley Kat bar. The music was pumping as soon as you hit the door. The source was unknown. People were enjoying the sounds, the drinks and each other. Out of all the places we checked out tonight, this place had the largest turnout. The Alley Kat was like a maze to me. 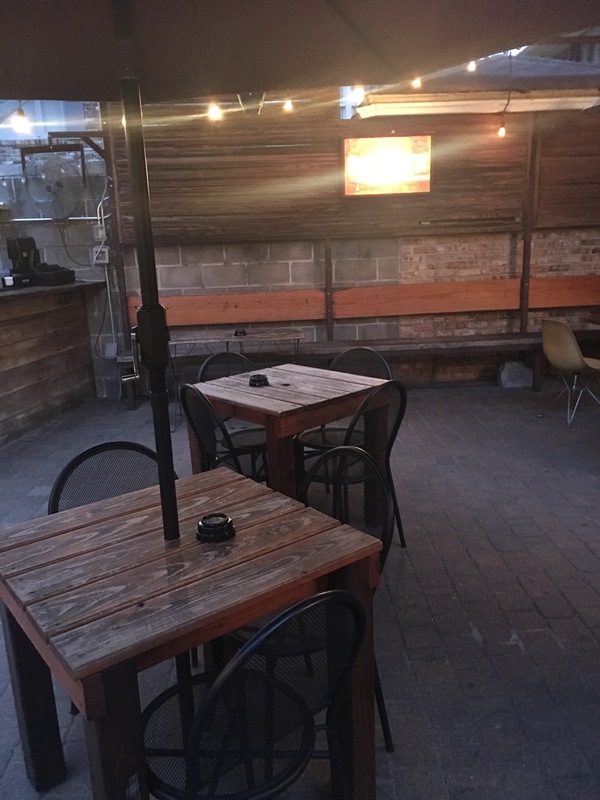 There was an upstairs featuring live music, and a separate downstairs section with more music possibly coming from a sound system, and outdoor seating protected from the immediate outside. The best part of Alley Kat was the female singer. I did not catch her name and I am still disgruntle over it… I just remember her singing like Chrisette Michele covering an India Arie song. She was great. Her performance to me was definitely worth that stop. Confirmation. It was meant to be. Number one was done. Number 2 was getting checked off on Saturday, and number three I didn’t think was going to happen. Katrina was not interested in going to The Breakfast Klub which is quite a hike from the home base, you’re almost always guaranteed a wait and with limited hours of operation (so we thought) it was looking like a “no go”. I had given up on eating at the Zagat rated restaurant. 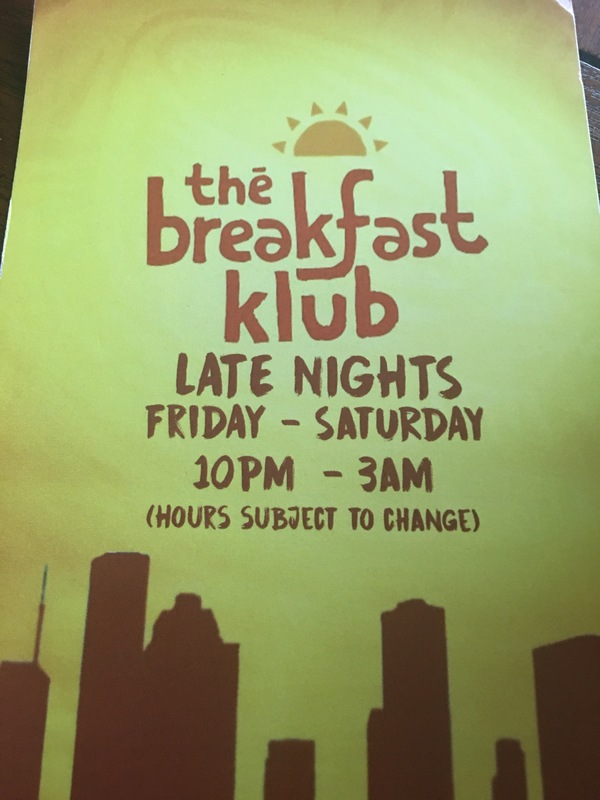 While walking through the maze of The Alley Kat bar a sign was posted noting The Breakfast Klub is now open from 10pm-3am. YES! YES! YES!.. There’s still a chance!…… The Alley Kat sat right behind The Breakfast Klub. I was destined to be there after all….It was fate….. Again, so I thought. My belly had been feeling queasy and full since the Hurricanes and I could not even consider just doing just a tasting here; where they were once voted one of the best breakfasts across america. I wanted to have a full scale smorgasbord tasting. The menu boasts of pancakes, wings and waffles, katfish and grits, biscuits and gravy, eggs and more!!!! I am heartbroken. No Breakfast Klub for me. Not tonight. Not this trip…. Today I am recovered from my Hurricane belly. I miss those wings and waffles I haven’t met yet. I was so close…..Yet, so far. Making the painful decision to abstain from breakfast for dinner; we decided to head to the homestead and prepare for tomorrow. Austin Texas our weekend adventure!